Look up crawl in Wiktionary, the free dictionary. 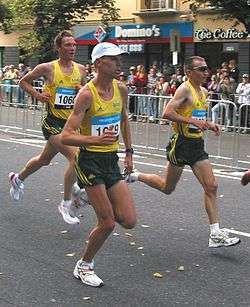 Humans using a running gait. Note the "suspended phase" in which neither foot touches the ground. Human gait refers to locomotion achieved through the movement of human limbs. Human gait is defined as bipedal, biphasic forward propulsion of center of gravity of the human body, in which there are alternate sinuous movements of different segments of the body with least expenditure of energy. Different gait patterns are characterized by differences in limb movement patterns, overall velocity, forces, kinetic and potential energy cycles, and changes in the contact with the surface (ground, floor, etc.). Human gaits are the various ways in which a human can move, either naturally or as a result of specialized training. Human gaits are classified in various ways. Every gait can be generally categorized as either natural (one that humans use instinctively) or trained (a non-instinctive gait learned via training). Examples of the latter include hand walking and specialized gaits used in martial arts. Gaits can also be categorized according to whether the person remains in continuous contact with the ground. The so–called natural gaits, in increasing order of speed, are the walk, jog, skip, run, and sprint. While other intermediate speed gaits may occur naturally to some people, these five basic gaits occur naturally across almost all cultures. All natural gaits are designed to propel a person forward, but can also be adapted for lateral movement. As natural gaits all have the same purpose, they are mostly distinguished by when the leg muscles are used during the gait cycle. The walk is a gait which keeps at least one foot in contact with the ground at all times. Repeat steps 1–5 to continue walking. Skipping is a gait children display when they are about four- to five-years-old. While a jog is similar to a horse's trot, the skip is closer to the bipedal equivalent of a horse's canter. In order to investigate the gait strategies likely to be favored at low gravity a series of predictive, computational simulations of gait are performed using a physiological model of the musculoskeletal system, without assuming any particular type of gait; a computationally efficient optimization strategy is utilized allowing for multiple simulations. The results reveal skipping as more efficient and less fatiguing than walking or running and suggest the existence of a walk-skip rather than a walk-run transition at low gravity. Charlie–Chaplin gait: occurs in tibial torsion. Too much is unknown about how the human nervous system controls locomotion; many regions contribute, such as the frontal lobe, cerebellum, basal ganglia, brainstem, and spinal cord. For example, the pedunculopontine nucleus (PPN) is a nucleus of the brainstem that helps to control the planning and execution of gait. The PPN is connected extensively with other parts of the brain, including the spinal cord, cortex, and basal ganglia; these regions work together to plan, initiate, and maintain gait. One variable in gait is foot strike – how the foot contacts the ground, specifically which part of the foot first contacts the ground. In sprinting, gait typically features a forefoot strike, but the heel does not contact the ground. a forefoot strike is in the front third (front 1/3 of shoe length). Foot strike varies to some degree between strides, and between individuals. It varies significantly and notably between walking and running, and between wearing shoes (shod) and not wearing shoes (barefoot). Typically, barefoot walking features heel or midfoot strike, while barefoot running features midfoot or forefoot strike. Barefoot running rarely features heel strike because the impact can be painful, the human heel pad not absorbing much of the force of impact. By contrast, 75% of runners wearing modern running shoes heel strike; running shoes being characterized by a padded sole, stiff soles and arch support, and sloping down from a more padded heel to a less padded forefoot. The cause of this change in gait in shoe running is unknown, but Liebermann noted that there is correlation between the foot-landing style and exposure to shoes. In some individuals, the gait pattern is largely unchanged – the leg position and foot position are identical in barefoot and shoe running – but the wedge shape of the padding moving the point of impact back from the forefoot to the midfoot. In other cases, it is conjectured that the padding of the heel softens the impact and resulting in runner modifying their gait to contact further back in the foot. A 2012 study involving Harvard University runners found that those who "habitually rearfoot strike had approximately twice the rate of repetitive stress injuries than individuals who habitually forefoot strike". This was the first study that investigated the link between foot strike and injury rates. However, earlier studies have shown that smaller collision forces were generated when running forefoot strike compared to rear-foot strike. This may protect the ankle joints and lower limbs from some of the impact-related injuries experienced by rear-foot strikers. There are gender differences in human gait patterns: females tend to walk with smaller step width and more pelvic movement. Gait analysis generally takes gender into consideration. Gender differences in human gait can be explored using a demonstration created by the Biomotion Laboratory at Queen's University, Kingston, Canada. Even though plantigrade locomotion usually distributes more weight toward the end of the limb than digitigrade locomotion, which increases energy expenditure in most systems, studies have shown that the human heel-first gait conserves more energy over long distances than other gaits, which is consistent with the belief that humans are evolutionarily specialized for long-distance movement. For the same distance, walking with a natural heel-first gait burns roughly 70% less energy than running. Differences of this magnitude are unusual in mammals. Kathyrn Knight of the Journal of Experimental Biology summarizes the findings of one study: "Landing heel first also allows us to transfer more energy from one step to the next to improve our efficiency, while placing the foot flat on the ground reduces the forces around the ankle (generated by the ground pushing against us), which our muscles have to counteract." According to David Carrier of the University of Utah, who helped perform the study, "Given the great distances hunter-gatherers travel, it is not surprising that humans are economical walkers." ↑ Minetti, A.E. "The biomechanics of skipping gaits: a third locomotion paradigm?". NIH.gov. Consiglio Nazionale delle Ricerche. Retrieved 12 June 2015. ↑ Ackermann, Marko; van den Bogert, Antonie. "Predictive simulation of gait at low gravity reveals skipping as the preferred locomotion strategy". NIH.gov. Centro Universitário da FEI. Retrieved 12 June 2015. ↑ Ker et al., 1995. ↑ Chi; Schmitt (Jul 2005). "Mechanical energy and effective foot mass during impact loading of walking and running". J Biomech. 38 (7): 1387–95. doi:10.1016/j.jbiomech.2004.06.020. PMID 15922749. ↑ Foot Strike Patterns of Runners At the 15-Km Point : The Journal of Strength & Conditioning Research (Hasegawa et al., 2007). 1 2 3 Modern Running Shoes & Heel Striking, Daniel Lieberman, Harvard University. ↑ Daoud, et al. "Foot strike and injury rates in endurance runners: a retrospective study" (subscription required). Medicine & Science in Sports & Exercise. ↑ Lieberman "et al". "Foot strike patterns and collision forces in habitually barefoot versus shod runners"
↑ BMLWalker V1.8, The Biomotion Lab. Gait animation. 1 2 3 Cunningham, C.B. ; Schilling, N.; Anders, C.; Carrier, D.R. "The influence of foot posture on the cost of transport in humans". Journal of Experimental Biology. 213: 790–797. doi:10.1242/jeb.038984. Retrieved 4 November 2015. ↑ Knight, Kathryn (2010). "Human's heel first gait is efficient for walking". Journal of Experimental Biology. Retrieved 4 November 2015. "The biomechanics of skipping gaits: a third locomotion paradigm?" A E Minetti Proc Biol Sci. 1998 July 7; 265(1402): 1227–1235.